It’s been hot for the past couple of days. I’ve been relishing the warmer weather by spending more time outside, making sure I have ample time to get some color get some Vitamin D. Of course, spending so much time in the sun can leave a girl feeling a little parched and can send one running back inside to find something refreshing to drink. And when you’re looking for a refreshing drink, you want something that is cold and isn’t heavy – something like a tall glass of iced tea. Founded in 2003, Tea Forté aims to capture the “Art of Tea”. We’ve consulted with chefs and restaurateurs in culinary havens worldwide to create the most innovative and delicious blends of tea with whole leaf teas, rough-cut herbs and flowers. Our pyramid infusers crowned with our signature leaf, combined with our custom-designed accessories, elevates a cup of tea into an extraordinary experience for all of your senses. I’ll be honest that I’ve never actually made iced tea. 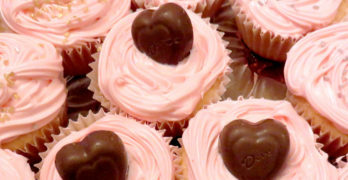 I’ve enjoyed, sipped, and even drunk iced tea, however I haven’t made it myself before. To help me along with my iced-tea-brewing experience, I have the Tea Forte Tea-Over-Ice Brewing Pitcher and the Tea Forte Nantucket Blend of teas. The Tea Forté Tea-Over-Ice Brewing Pitcher is an elegant pitcher that actually consists of two pitchers. The top pitcher is smaller and rests on top of the opening of the bottom pitcher. To prepare the perfect glass of iced tea, first boil some water. While the water is heating, go ahead an fill the bottom pitcher with ice – this is critical since it’s what will turn your tea into iced tea. 🙂 Then, choose one of their very cool tea pyramid infusers to brew. They have an array of delicious tea flavors and types to choose from. For our pitcher of iced tea, we chose their classic Ceylon Gold black tea. Put the pyramid infuser inside the top, smaller pitcher. 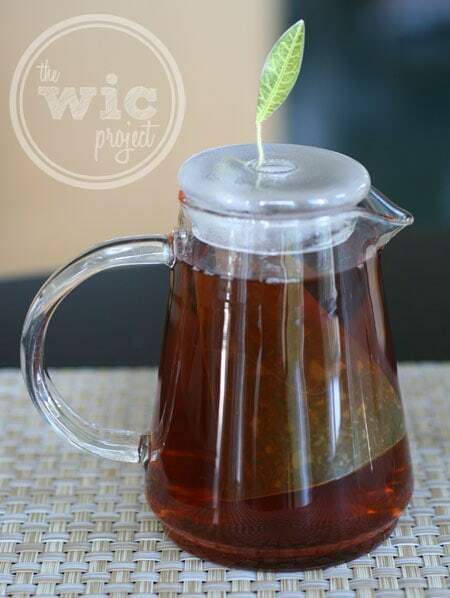 Once the water is ready, pour it into the top pitcher and let it steep for 3-5 minutes. After the tea has brewed, pour the top, tea-filled pitcher into the bottom, ice-filled pitcher and voila! Iced tea! And now, let’s get to the tea. Ah – the tea. This is quite possibly the most refreshing glass of iced tea ever. It is perfectly cooled when poured over ice. The flavor isn’t too strong or too weak and helps you feel cooler with each sip. It also has a very clean flavor without any weird or bitter aftertaste. 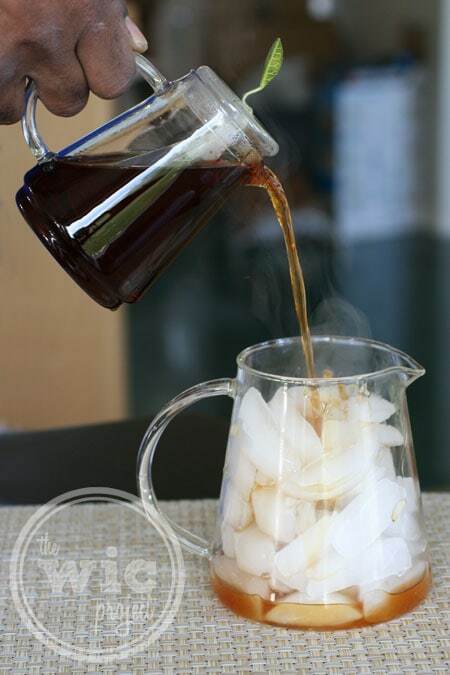 You can pour two tall glasses (or three shorter glasses) of iced tea from the Tea Over Ice Brewing Pitcher. Not only was the iced tea completely amazing, but I actually had a lot of fun brewing the tea (as weird as it sounds.) 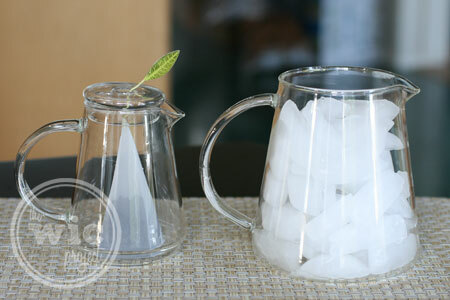 I love the clean and elegant design of the Tea Over Ice Brewing Pitcher. While the pitchers are made of glass, they do not feel too fragile. If you’d like to pick up this amazing pitcher to help you brew up refreshing and delicious iced tea, then head over to the Tea Forte website and purchase it online. 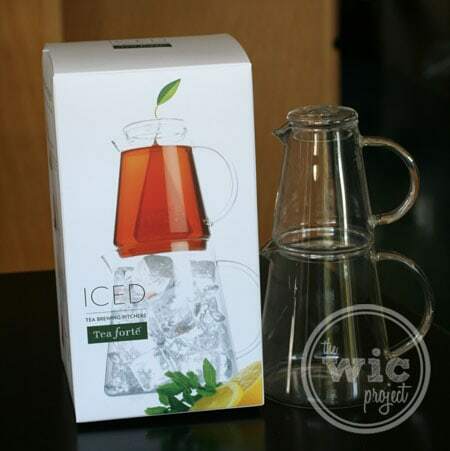 For the month of June, you will receive a FREE set of Iced Tea Glasses, a $15 value, when you purchase the Tea Over Ice Brewing Pitcher and 5-pack of Tea Over Ice when you purchase from the Tea Forte website. You can also purchase the Tea-Over-Ice Brewing Pitcher online from Amazon for $29.95. I’ve never made iced tea either…but this set is such a cool concept! I love it and it sounds like something I could definitely do without messing it up lol. I love iced tea and I’ll be going to check this out. Thanks for a great review! You’re welcome! I agree that the set is very cool and it almost makes brewing iced tea “fool-proof.” Just brew and pour! looks nice. I make a gallon every other day–seriously. This Tea over Ice Brewing System is pretty cool. I would love it as we are big ice tea drinkers in our house.